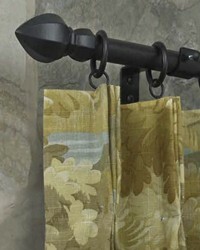 Cafe curtain rods and rings for hanging curtain and drapes. 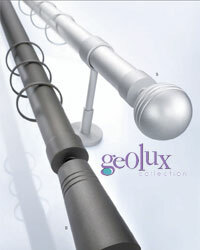 1 inch diameter and under curtain rod collections. 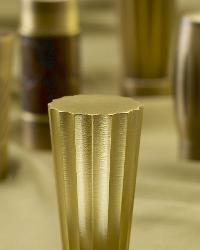 Elegant 3/4" diameter plated metal curtain rods and hardware will a great decorative touch to your window treatments. 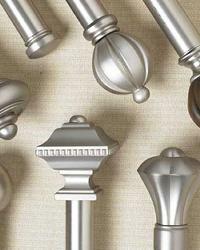 The Classic Minimalism by Fabricut offers modern styled curtain rods, finials, brackets and curtain rings in chrome, gold brass and black nickel. 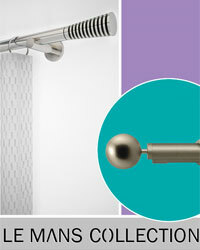 Additional hardware accessories include bypass brackets, elbows and splices for long length curtain rods. 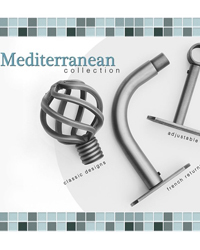 Experience the attractiveness and versatility that the 3/4" diameter Vesta Mediterranean iron curtain rods and hardware accessories offer. 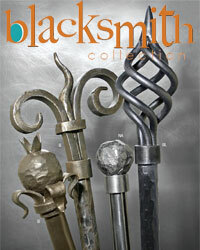 Featuring five appealing finishes and an assortment of 11 hand crafted iron finials with drapery hardware and accessories suitable for a variety of design schemes. The 3/4" diameter iron curtain rods are offered in 5, 6.5 and 8 foot lengths with a splice being available for longer lengths. 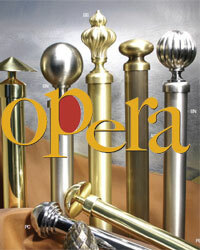 The Vesta Opera metal curtain rods quality brass components in an array of traditional and contemporary designs make these metal curtain rods a great choice. 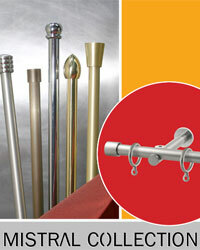 Choose from two curtain rod sizes that include 3/4" and 1 1/8" diameter brass tubing. 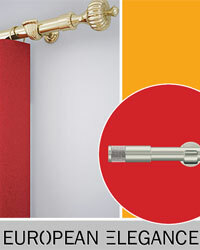 A tube splice is available to create an extra long curtain rod. 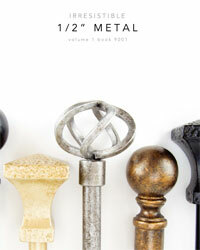 These metal curtain rods and hardware are in stock for quick shipping. 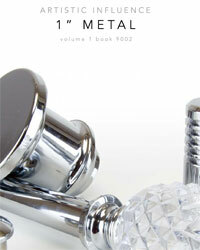 Choose from finishes in brass, nickel and chrome. 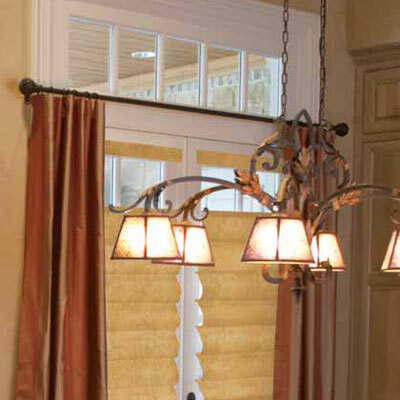 The contemporary curtain rods and modern curtain rods in the Palladia Bronze curtain rods and hardware incorporate contemporary, clean lines and elegant details to create exquisite stylings. 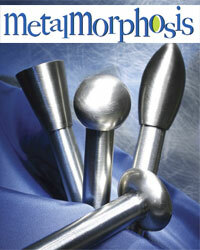 Each element of these metal curtain rods is crafted with extremely fine attention to proportions, aesthestics and technique, providing you with a true work of art. 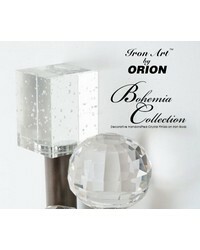 The modern and contemporary looking finials offer metal that is paired with crystals for a truly unique look not found in any other curtain rod line. 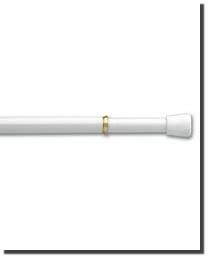 The 1" diameter metal curtain rods are available in 6 and 8 foot lengths and offer mounting brackets for wall and inside applications. 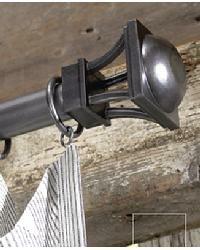 Holdbacks and flat curtain rings with eyelet are also available. The Palladia Satin Brass curtain rods and hardware incorporate contemporary, clean lines and elegant details to create the exquisite designs found in their finials, brackets and curtain rings. 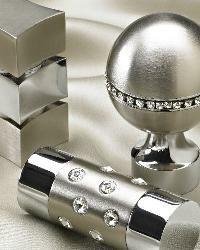 Some of the curtain rod finials have Swarovski crystals that have been combined into the modern look that is offered. 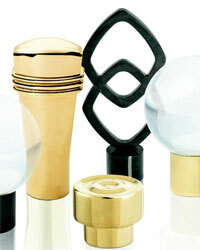 The 1" in diameter brass curtain rods are offered in 6 and 8 foot lengths with a connector being available for larger windows. 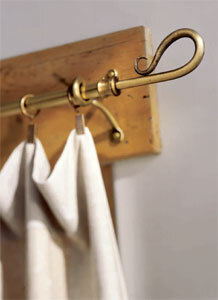 Hardware includes wall brackets and an inside mount bracket, along with brass curtain rings and holdbacks. 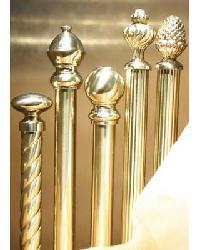 Each element of this brass curtain rod offering is crafted with extremely fine attention to proportions, aesthestics and technique, providing you with a true work of art for enhancing your window treatments. 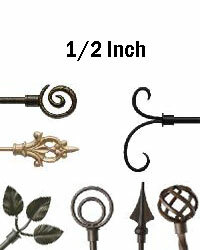 This selection offers beautiful 1/2 inch sized wrought iron curtain rods and hardware accessories that are great for use with cafe curtains and when hanging wall tapestries, along with a crane swing arm rod option. 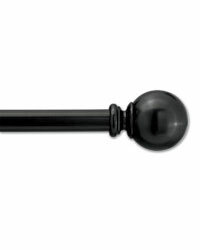 Made in the USA, these 1/2" wrought iron curtain rods are offered in a selection of 59 finial styles that range from modern to traditional in 30 color choices. These small wrought iron curtain rods are available in round, twist, square and hammered styles and are cut exactly to the length you specify. The brackets offer several projection depths, for an extra close fit to the window or wall as well as the typical projection depths. 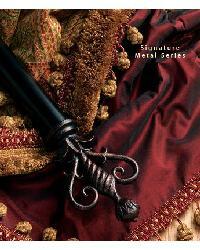 The wrought iron curtain rings are available in an S shape as well as the standard round design with eyelets or clips. 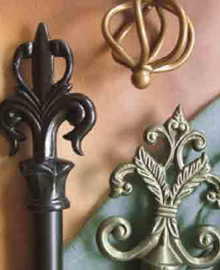 Other hardware accessories in this wrought iron curtain rod selection are batons or drapery pulls with a hammered look as well as wall brackets to accommodate corner window treatments. 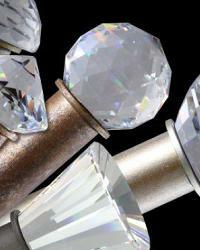 These beautifull contemporary styled finials made with Swarovski crystals are combined with curtain rods, rings and holdbacks in over 35 designer colors. 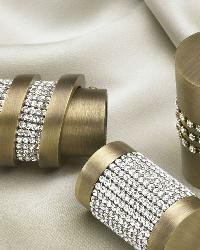 The curtain rods in the Swarovski Crystal Elements are available by the foot in 3/4" and 1" diameters, in a hammered and twisted style as well as the standard smooth look. 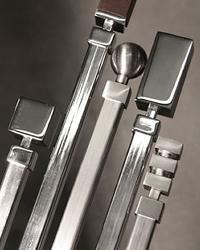 Wall brackets in various projections are available for both single and double curtain rod applications, along with a corner wall bracket for unique window treatments. 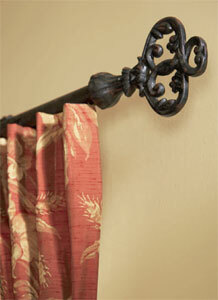 The curtain rings are made of wrought iron and offer eyelets as well as clips for your decorating options. 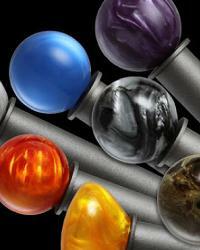 The curtain rod hardware also offers holdbacks with crystal balls that add a stunning and breath taking look. 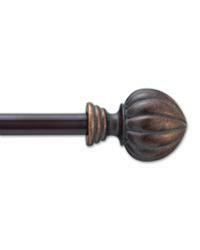 Old World Spanish influences embrace modern touches in this wrought iron curtain rod offering. 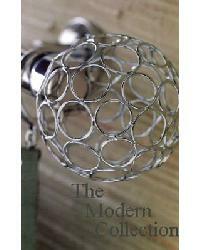 Kirsch designers, in concert with interior designers from around the country, shaped these exciting curtain rods that ranges from classic profiles to unmistakably modern motifs. 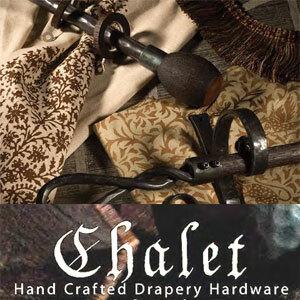 The hardware accessories include single and double brackets, holdbacks, rings, finials and a stoutly made 1" curtain rod in five dazzling finishes of: Black, Rust, Iron Oxide, Iron Gold and Antique Pewter. A striking expression that is both organic and sophisticated, these wrought iron curtain rods will complement your window treatment vision.